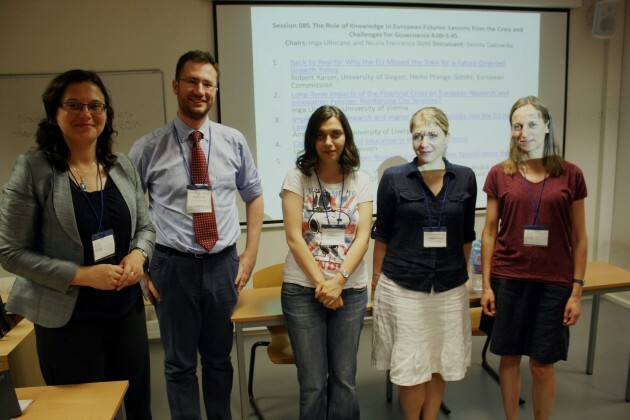 The 22nd International Conference of Europeanists ‘Contradictions: Envisioning European Futures’ was held by the Council for European Studies (CES) at the Sciences Po, Paris, July 8-10 2015. During the three days, more than 1000 scholars from around the world discussed their research on Europe in more than 300 sessions, roundtables and plenaries. In addition to traditional European studies topics such as welfare states, migration and democracy, several sessions dealt with themes of knowledge, research, higher education and academic governance. The session ‘The role of knowledge in European futures’ organized by the collaborative research network on European Research Area (ERA CRN) brought together contributions from political scientists, lawyer, philosopher and economic geographers dealing with European research and higher education policies. Robert Kaiser from University of Siegen and Heiko Prange-Gstöhl from the European Commission analyzed the EU’s failure to come up with a more future-oriented budget that would put research and innovation policies at its core. Inga Ulnicane from University of Vienna explored potential long-term impact of the economic crisis on old tensions in European research and innovation policies: basic vs. applied research and innovation leading vs. catching-up countries. Andrea Gideon from University of Liverpool undertook a legal analysis of the new EU framework for state aid for research, development and innovation. Lavinia Marin from KU Leuven brought in a philosophical perspective on the concept of citizenship in the Bologna process. Nicola Francesco Dotti together with colleagues from Vrije Universiteit Brussel contributed an economic geography view on the spatial distribution of the EU Framework Programme participation. The ERA CRN session had fruitful exchanges with a session on reconfiguring the European Academy that discussed internationalization and Europeanization of higher education policies. Other sessions on education dealt with topics such as social aspects of learning in contemporary Europe, the role of political parties in higher education and vocational training policies and changing academic governance. The plenaries and roundtables provided insights in ongoing theoretical and empirical debates in European studies. The conference highlights include a plenary on European futures with Peter A Hall and Jacques Rupnik, a discussion on varieties of capitalism with Vivien Schmidt and Jonas Pontusson and a keynote speech on economic inequality delivered by Thomas Piketty and discussed by Wolfgang Streeck. In 2016, the 23rd International Conference of Europeanists ‘Resilient Europe?’ will take place in Philadelphia, US, April 14-16. This entry was posted in Education, Politics & Public Policy, Science & Technology, The EU and tagged Bologna process, Europe of Knowledge, Framework Programme, higher education, research policy. Bookmark the permalink. Previous: How do European institutions use scientific expertise?